Question: Which Disinfectant Works the Best? When you wash your hands you are trying to remove any germs that may be on them from touching things around you. The same concept applies when you wash dishes, wipe a counter or mop a floor. For most of the above activities we use a soap or other disinfecting solution to aid in removing the germs. In this experiment we are going to test a few common disinfectants found around your house to see which removes germs the best. 2. Put your gloves on and wipe the piece of lunch meat evenly all over the entire cutting board. Wipe as evenly as you can and then leave it out overnight. 4. Prepare your disinfectant solutions by numbering six small cups #1-6 using your permanent marker. Each numbered cup will match one section of your cutting board. 5. Fill each cup with a different disinfectant and make sure you write down which cup number corresponds to which disinfectant solution. Fill the first cup with water as a negative control solution. 6. In your lab notebook, make a data table like the one below to record your results in. 7. Using the forceps, grab a cotton ball from the unopened package. Dip it into one of the solutions and rub it on the surface of the cutting board with the corresponding number to the cup of solution you dipped the cotton ball in. 8. After each application, throw the cotton ball away and dip the forceps into an extra cup filled with rubbing alcohol to sterilize the forceps. 9. Repeat steps 7 and 8 until you have applied a different disinfectant to to each square of the cutting board. Allow the board to dry completely. 10. After all sections of the cutting board are dry, you are ready to use your Nutrient Agar Kit to grow bacteria. Prepare the agar plates by numbering them 1-6 to correspond to the sections of the cutting board. 11. Use the forceps to grab a clean Q-Tip from the unopened package and swipe one end across one section of the cutting board using a circular motion. Be sure the end of the Q-Tip does not touch anything else. 12. Using your free hand, open the lid of the agar plate that corresponds to the section of cutting board you swiped with the Q-Tip. Run the end of the Q-Tip across the agar plate in a zig-zag motion. Immediately replace the lid of the agar plate and use some tape to secure it. Make sure during this process you don't set the lid down and get it contaminated before placing it back on the agar plate. 13. Repeat steps 11 and 12 until you have swabbed each section of the cutting board and applied it to an agar plate. 14. Leave the agar plates on a cookie sheet in a warm place for 1-2 days, until you can visually see bacteria colonies. 15. 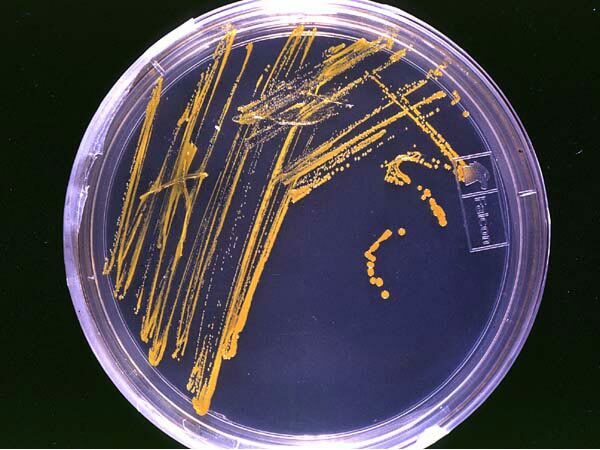 Count the number of colonies on each agar plate and write down the number in your data table in your lab notebook. 16. Take a picture of each plate so you can have an actual picture to show the colonies on each plate. 17. Graph your results and compare the different disinfectants. Which worked best? Which performed the poorest?